The DEWALT Tool Chest and Cabinet features soft-close drawers that fully close without the need to slam shut and stay securely closed while the unit is maneuvered around a worksite. A single locking drawer keeps personal items safe and secure. Heavy-duty ball-bearing slides allow drawers to glide smoothly, supporting up to 100 lbs. each while the large-capacity bottom drawer supports up to 200 lbs. Soft-close drawers prevent slamming and finger-pinching. Security drawer keeps valuables locked. Top till lid handle allows ease in opening and closing the top lid. Heavy-duty drawer slides stand up to frequent use and hefty contents. 18 in. D provides storage capacity needed for a variety of tools. Heavy-duty casters with reinforced mounting channels support 1400 lbs. (2 fixed, 2 swivel with full braking capabilities). ULTIMATE POWER AND INNOVATIVE SOLUTIONS. Quality tools and accessories that professionals depend on. Built tough to handle your most challenging tasks. Solid performance that makes short work of all your projects. Innovative products since 1924. 18 Pro Contractors Closed-Top Tool Bag. The Dewalt FatMax 4-in1 Rolling Workshop includes a toolbox, part bins, portable tray and oversized lower bin for larger items. The multi-level mobile work station allows easy access to all four storage areas at the same time. The large front latch locks the entire unit automatically when the Mobile Work Station is closed. Heavy-duty 7-inch wheels are rubber coated to provide great mobility and stability. Additional integrated features include a telescopic handle for easy manoeuvring and a v-groove on the toolbox lid for holding materials such as lumber and pipes in place for cutting. Keep your workshop clutter-free with the Husky 26 inch Six-Drawer Tool Chest and Cabinet Set in Black. This tool storage system is designed with a detachable top chest for easy movement and reorganization. Great for heavy use, it is built with a 21-gauge steel construction to ensure toughness and structural integrity. This tool cabinet is made with a powder coated finish to increase resistance to corrosion, weather and staining. It has a reinforced lid, which provides protection for your tools to ensure they don't get damaged. This tool chest has 6 drawers - 4 medium and 2 large and features a total holding capacity of 8,977 cu. in. Perfect for smooth operation, it is designed with ball bearing slides that can hold up to 50 lbs. to handle heavy loads. Ideal for keeping your tools secure, it is designed with an internal locking system with two keys. This high-quality tool chest is designed with swivel casters to provide you with ease of mobility. 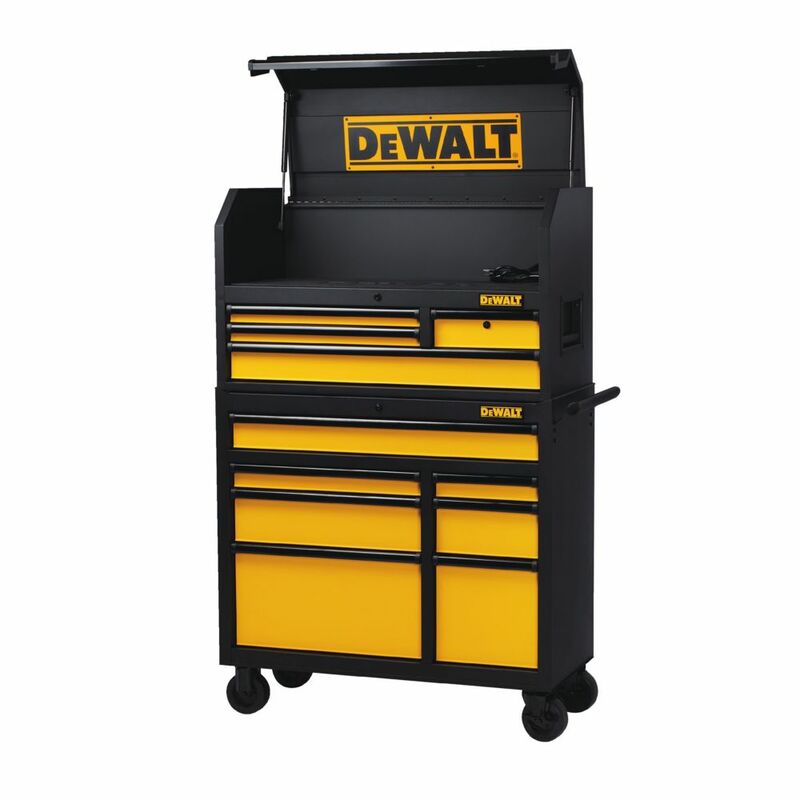 40 Inch Metal Storage The DEWALT Tool Chest and Cabinet features soft-close drawers that fully close without the need to slam shut and stay securely closed while the unit is maneuvered around a worksite. A single locking drawer keeps personal items safe and secure. Heavy-duty ball-bearing slides allow drawers to glide smoothly, supporting up to 100 lbs. each while the large-capacity bottom drawer supports up to 200 lbs. 40 Inch Metal Storage is rated 4.7 out of 5 by 87. Rated 4 out of 5 by geee from Great tool chest got on clearance I gave it a 4, because of things I would change to fit my needs. I wish the switch had a light like most power bars. One of the bottom drawers should of been 2 drawers for more tool storage. Reinforce the handle on the lower chest. Having another key for one drawer is kinda useless in my 2 car garage. To end on some positive things are 1) I can fit all my battery tools and packs in one drawer. 2) Love the top work station.3) It can take more weight in the drawers than other tool chests. Rated 5 out of 5 by Wigman42 from Why is this discontinued?? Why is this discontinued?? Rated 4 out of 5 by Dan from Good value for the amount - I wish it had a little thicker padding for the drawers - similar to t... Good value for the amount - I wish it had a little thicker padding for the drawers - similar to the padding for the top - that would be nice. Also some of the drawer slides seem a bit off (one side pulls out further than the other). Other than that, very happy with it. Rated 3 out of 5 by Carl from It is a vary nice looking toolbox. The soft close... It is a vary nice looking toolbox. The soft close drawers are nice also. The material is a thinner gage then I had hoped for, when you move the box by pulling or pushing on the attached handle, the side of the box flexes very easily (That’s with the box being empty). Shipping was not good, the top and bottom boxes arrived on different days (2 days apart), one side of the bottom box was dented (I did not notice until it was completely unpacked and the delivery driver had already left). Rated 5 out of 5 by Spider from Love the power outlets! Its working out well in our garage. Exceeded expectations. Love the power outlets! Its working out well in our garage. Exceeded expectations. What is the overall height of this tool cabinet when the top door is open all the way?